Problem. Issue. Challenge. Call them what you will, all parents face them. Ultimately, all parents also want to not be facing them. Our culture, and most of our own backgrounds and experience tell us to spot the problem (usually “out there”) and find a solution (often with parenting something to make our child do as we want her/him to do). 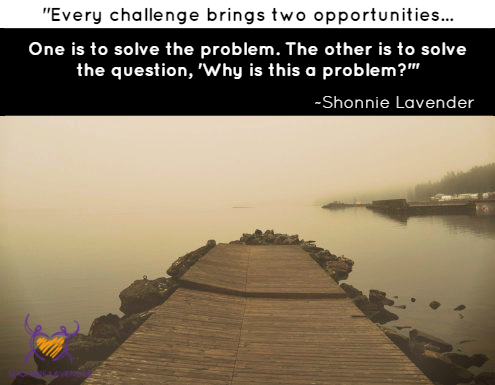 So problem-solving is where we often focus our attention when we’re facing one of those challenges. Basically we’re looking for the technique, tool, method, or magic that will change what we don’t want to happen into what we do want (whining toddler becomes non-whining toddler, snarky teenager becomes polite teenager, bed-wetting child stops wetting the bed). Fixing “problems” is useful and is something we all desire — there’s nothing wrong with this. The other — often overlooked — opportunity in each challenge moms and dads face is to see why we believe the issue at hand is a “problem.” The reality is that life is neutral (as are others’ behaviors). We define them — good/bad, right/wrong, loving/hurtful, respectful/disrespectful, responsible/irresponsible — and thus foster within us the likelihood of seeing the issue as a “problem” or not. Our definitions usually reflect all of our unconsciously held beliefs, our stories, our personal history, and basically all the influences of our lives. Even if many other parents would hold the same opinion (that is a “whiny” voice, that child is “misbehaving,” etc. ), it’s still merely a judgment AND it’s still a significant part of why we’re even calling the behavior/event a problem and reacting to it strongly. While this opportunity to dig deeper — determining why the issue is a “problem” — isn’t as regularly taken as the more straight-forward “problem solving,” the rewards it offers can be much richer and profound. Often, in fact, when we get to the root of why we’re experiencing the behavior/event as a “problem,” the behavior stops happening. It’s like magic! So today I’d like to invite you to start taking this second opportunity more often and to take it before you even attempt to “fix the problem.” Become a scientist, explorer, discoverer — I know you’ll find some real treasure!